The children and I carefully took down each colorful scarf from around our fairy tree and laid them all on the couch. I’m interested in things that invite active play and engagement—signs of motivated learning, rather than a passive waiting to be entertained. And through the years I’ve noticed how scarves or other fabric squares can be a simple yet vital addition to children’s self-initiated play, once they understand how to play safely with them. I’ve enjoyed seeing young people use them for everything from dressing dolls, transforming puppets, and comforting stuffed animals, to juggling (these particular movement scarves are 27 x 27, nylon, and float rather unhurriedly). I’ve also seen children tie scarves together (sometimes they ask for my help) to create a cape, a skirt, a dress, a colorful tent, a dropped ceiling, a chandelier decoration, or—most recently—the swirling mountain fog that celebrated our little tree. The scarves were on the couch only moments before my granddaughter swooped up two red ones and a purple and taped them carefully over the roof of the dollhouse, creating a festive blush of warmth, activity, and coziness. Within minutes she was motivated to reorganize all the dollhouse furnishings in a whole new way, and kept a sustained focus on this task for a good half hour, getting things to reflect just the atmosphere she wanted. She placed Grandma and Grandpa in their rocking chairs in the living room, next to fall pumpkins, the Christmas tree and its presents, and the porcelain mama cat and tiny kittens, each with a bowl of food. As you can see, a yellow finch has claimed the middle room (with desk, sewing machine, and chandelier of large red winterberries). Here my granddaughter also made a sizeable nest of white paper colored with green and decorated with a red ribbon. I saw the calm confidence with which she put the finishing touches on this project. 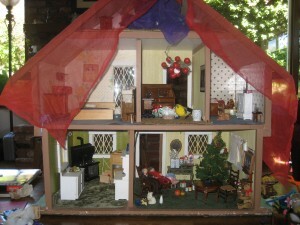 Something about the lustrous red scarves had brought forth an idea that resulted in her active and focused engagement with the dollhouse over the course of an afternoon.